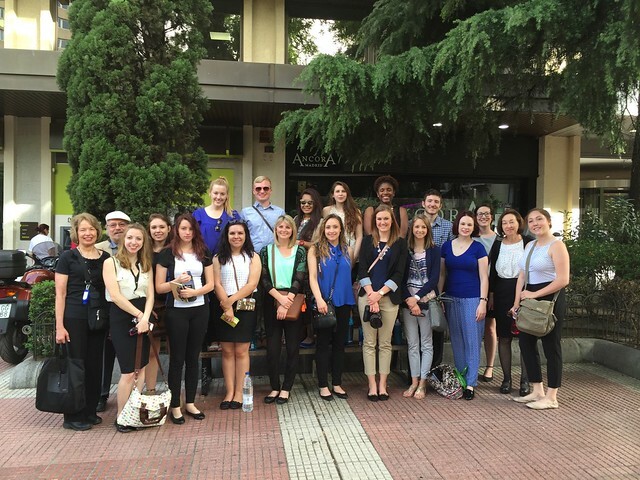 Sixteen students in Point Park's International Media class traveled abroad to explore media and culture in Spain and Portugal, May 11-23. Professors Helen Fallon and David Fabilli, retired faculty member Jan Getz and Emily Kolek, a graduate assistant and M.A./M.B.A. student, accompanied the group. "We had amazing access to Spanish and Portuguese media and communication agencies, and as in our prior trips, the visits did not disappoint us. It is one thing to read about a newspaper, public broadcasting system, magazine or advertising agency. It is entirely something else to visit," said Fallon. Some of the media visits included CondÃ© Nast, Ketchum, Havas Media Group, Televisio de Catalunya, LaVanguardia and the Research Center in Media and Journalism at the University of Lisbon. "Some of the key messages I took from the media visits are that journalists will always have a place in this world, innovation is key and it is important as a brand to care about people," said Alicia Green, a senior journalism major. "We also had the opportunity to talk with our hosts at the media visits and some of the students learned more about how to land an internship abroad." The group also enjoyed cultural visits to Madrid's Royal Palace, Valley of the Fallen, a walking tour of Segovia (Aqueduct, Cathedral and Alcazar), Camp Nou, La Sagrada Familia, Park of Nations and the UNESCO town of Sintra. "I think it's very important to experience another country's culture. Not only do you get to learn how others live, but you get to experience it," said Kariann Mano, a senior public relations and advertising major. "We learned about the country's culture, history, economy and current status. It was truly a unique experience." No trip is complete without indulging in the country's cuisine. Whether it was tapas, paella, helados or pastel de natas, all of the students agreed that the food was delicious. "I really, really loved the food! You could taste how fresh it was. I ate so much seafood and ate four or five pastel de natas a day (a cream pastry cup sprinkled with cinnamon)," said Rilyn Gancia, a recent graduate of the sports, arts and entertainment management program and a marketing assistant for the CONSOL Energy Center.